The romantic era of the '70s fashion was all about rocking feminine paisleys and ethnic inspired prints, mixing delicate detailing and the bohemian styling for a free spirited look. Back then, fashion was linked to freedom, mixing a crazy amount of colours and miss and matching different styles with each other (which is a perfect tip today to maximise your clothes’ wear). This era marked the presence of a huge number of unlike styles; hippies, punks, bohemian chic, you name it. As freedom was the main concept for fashion, this period is characterised by its open-mindedness and boundless creativity due to the lack of any style rules and ideals. Uniqueness and a distinctive vision of style and inspiration were huge, even if it meant leading to a little craziness when putting outfits together. Which is why it does not surprise me that world-famous designers frequently revisit this era and why we are have seen some many aesthetics of the '70s brought back, albeit spiced up and with modern twists. Button-downs, flares, culottes, fringes, overalls, earthy tones, turtlenecks; the list can go on and on! 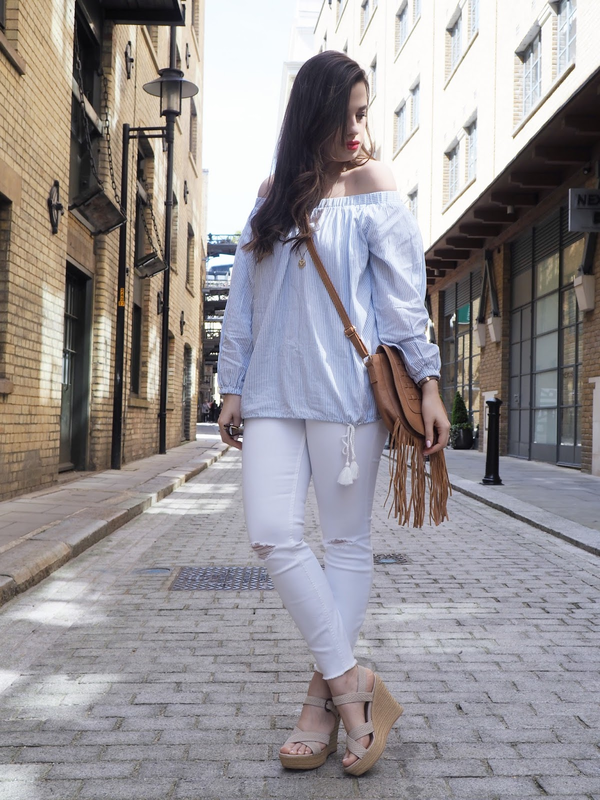 Off -shoulders, white jeans, throw in some fringes and platform sandals and you have yourself a perfectly '70s inspired outfit, and that is exactly what I was going for with this look. WHITE DENIM is ageless, and ageless denim has a lot to do with seventies fashion. I have always loved hippie styles jeans with ripped knees and fray hems, and these ones I recently picked up are perfect. This OFF-SHOULDER is inspired by the '70s boho-chic fashion, and is extremely carefree and relaxed aka ideal for a spring sunny day. Flowy, lightweight, and anything in rich prints and patterns is highly recommended to rock this trend. In terms of footwear, platform shoes and sandals are the best options for some serious seventies vibes. RAFFIA works well for this and not only are these from UGG at M and M Direct incredibly cute; they are also a very hot trend at the minute. To finish things off I opted for yet another '70s inspired accessory: the typical handbag featuring FRINGES. Some say it can be tricky to wear retro trends, especially from the 1970s due to their diversity. I however find it super fun given that there are SO many different styles that you are bound to find one that best describes your personality. What do you think about the seventies fashion coming back? What are some of your favourite trends? Let me know below! Love this off-the-shoulder top girl, it's lovely! As fotos estão muito giras e o look também! Bem lindo esse Look Pam ! wow so pretty. I love the way of your style. White dresses are always my first choice. I like to buy designer lehengas for the wedding season. Thanks for sharing with us. You look absolutely gorgeous! Those sunglasses really do suit you very nicely. The wedges you're wearing here look incredibly comfortable and great for daytime wondering. you are rocking that off the shoulder trend! I like so much your top and the fringe bag! Pam, you look absolutely lovely in this look and I'm totally digging the 70s vibe. Love that distressed white jeans on you, so chic! Love this Pam, the white jeans are perfect! Love the boho vibe, Pam suits you beautifully. Such a cute top! I love this look! You look gorgeous! Love your makeup darling! Beautiful top! I adore the 70ies fashion (and the 70ies hair), so I am excited to wear similar things come summer. I love your styling Pam, those wedges are gorgeous! Love the outfit and those sandals are just perfect! Un look muy juvenil y primaveral el bolso es precioso estas muy guapa un beso. Great outfit! And good job posing! Fashion still express freedom! You are gorgeous! Love this offtheshoulders blouse! This outfit is perfect, I love everything about it, from the off shoulder to, to the wedges- amazing! Love the blouse <3 Such a beautiful outfit!!! I love ur sunglasses, so retro! this outfit is beautiful ! i love it! You look amazing Pam. I love the top and the styling is so fab. 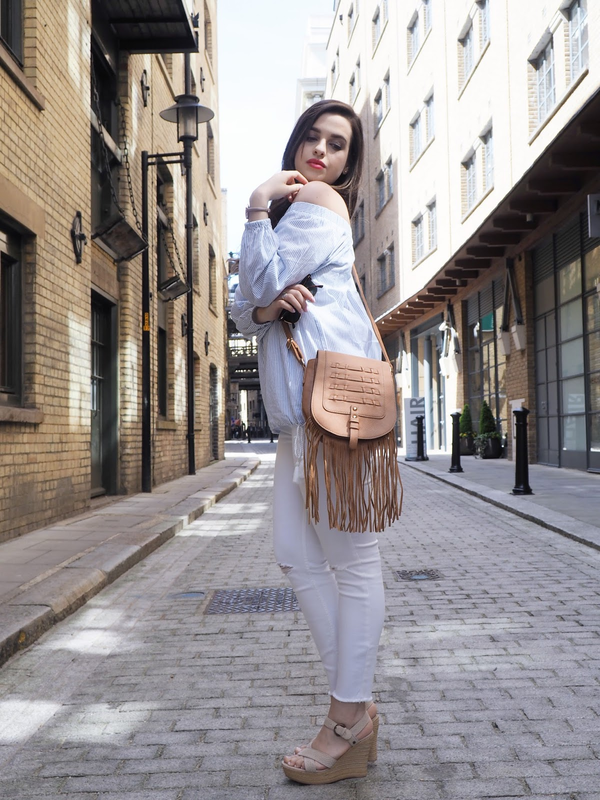 Love this look, and the fringe bag is so cute! I love this look! I've been looking for an off shoulder top, have to see if this is still available I love it! These pictures are stunning! Such a lovely outfit too. I need the off the shoulder top in my life!! Such a beautiful article! I love your outfit a lot! OMG! It's such a gorgeous outfit. Looove that "cold shoulder" top, and how you balanced soft light tones with earthy shades. Yes and yes! 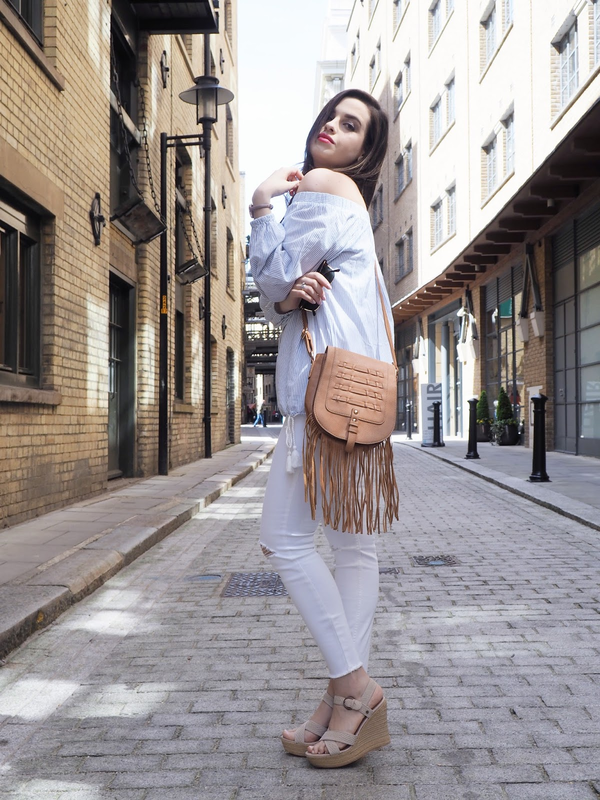 This look is perfection on you, we are loving the off the shoulder top and fringed purse, so chic! The 70's had so much fun fashion choices, you definitely nailed it! Adorooooo tudo neste look, especialmente o topp of the shoulder, super na moda esta estação! Looking pretty in off shoulder tops for girls. And you bags also perfect match with your dress..